Emails that trigger a Message Rule with a Final Action of Quarantine - Company will be placed in the Global Quarantine. Email Security users also have access to a Personal Quarantine. To see recently quarantined messages, visit your USS Dashboard and click Products ⟶ E-mail Security ⟶ Global Quarantine. Choose a timespan to view from the drop-down list. 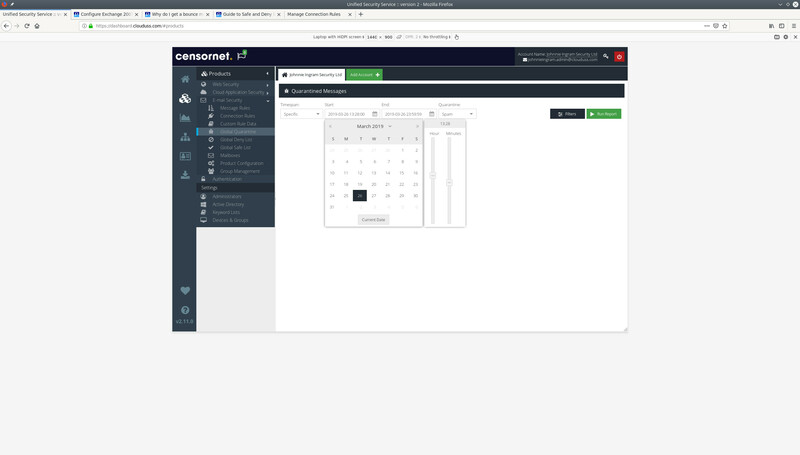 You can choose to view data for the last hour, day, week or month; or you can specify your own time range by choosing Specific and using the data picker. Choose whether you want to view emails that have been quarantined as Spam or emails that have been quarantined as possibly containing a Virus. Optionally, you can click to narrow down the results by a specific Sender, Recipient, Subject or email Direction. The local timestamp for the email (when it was sent or received by the server). The recipient(s) of the email. To see more detail about a quarantined message, click the icon next to the message. The Message Detail window will be displayed. Use the General tab to see a summary of the email. You can click the GUID to open an Email Activity Report that contains the email. The Actions tab will list all the actions that have been taken against this email. This includes Rules that the email has triggered but which have not resulted in a Final Action. Use the Headers tab to see a detailed breakdown of all the message headers in this particular email. You can use the button to export the email headers, either to .csv format or to an Excel spreadsheet. You can see the full server log for this email. This will show every interaction the server has performed for this email. You can use the button to export the server log for this email, either to .csv format or to an Excel spreadsheet. 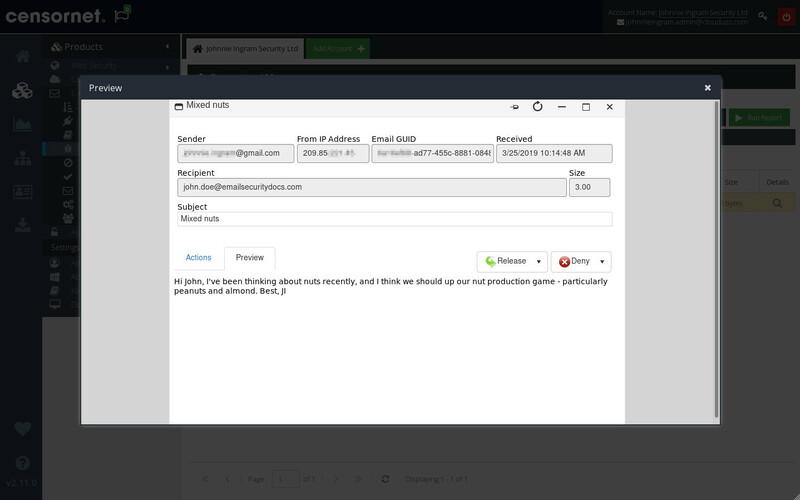 You can safely preview a quarantined message by clicking the email's subject in the Global Quarantine screen. You can choose to either Deny or Release a quarantined email. By doing so, you will teach Email Security what action to take against similar emails in the future. Click to select an email from the list, and choose to either Delete, Deny or Release. To delete the email, click the icon. Deleting a message will remove it from the Global Quarantine list, and permanently delete it from the server, but will have no effect on future emails. To deny an email, select the email and choose an option from the drop-down list. The email will not be delivered, and any further emails sent to your server from the same sender will automatically be denied. The email will not be delivered, and any further emails sent to your server any address at the originating domain will automatically be denied. To release an email from quarantine, select the email and choose an option from the drop-down list. Releases the email from quarantine, but has no effect on further emails from the same sender. 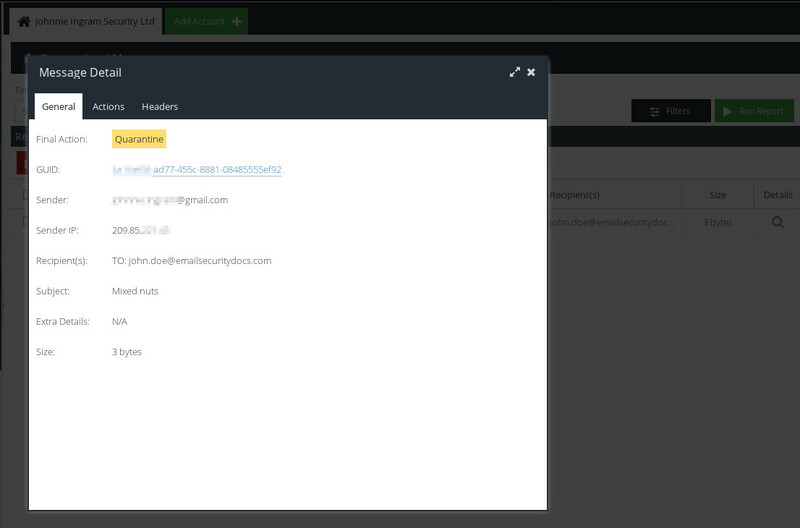 Releases the email from quarantine, and adds the sender's email address to your Global Safe List. 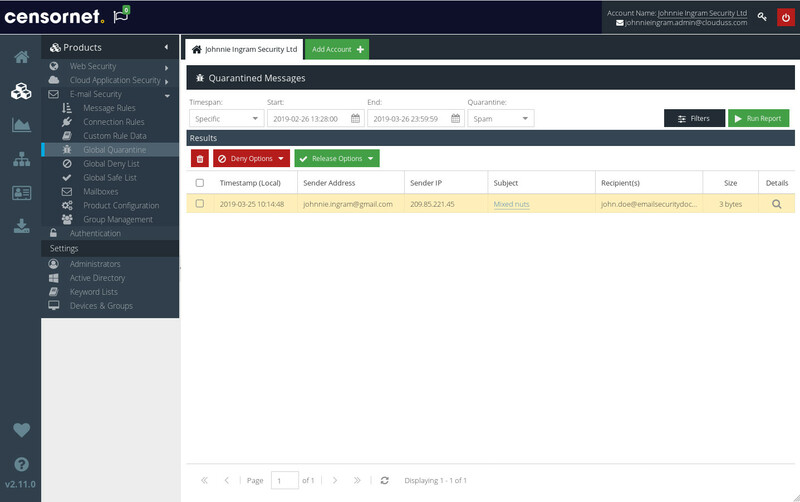 Releases the email from quarantine, and adds the sender's domain name to your Global Safe List.